The purpose of the guidance materials in the Early Years Quality Improvement Support Programme (EYQISP) is to provide local authority early years consultants and leaders of early years settings with tools to support continuous quality improvement in line with the principles of the Early Years Foundation Stage Framework. They also draw on the Ofsted self evaluation form and the National Quality Improvement Network’s principles. 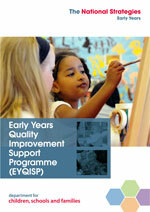 Download Early Years Quality Improvement Support Programme (EYQISP). This document is not down loadable. It creates a server error. Sorry about this, it should be fixed very soon! It's really good to see that this document is still available to all. I was asked a question today about maths outdoors and was able to sign post the enquirer to the PDM and audit in this highly informative document. Is there anyway to get a hard copy of this publication? Hi Elsa, unfortunately the Department for Education is only making this document available to download.